check out this sweet banner I found in the millalove Etsy shop! That little baby in the photo to the right is about to celebrate her very first birthday. 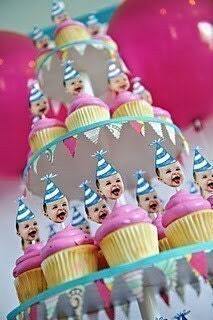 First birthdays are always so fun but also sort of difficult to plan because although the party is for a 1 year old, it's really for the adult guests. I think I've come up with a fun theme that bridges the gap... it's a photo/picture themed party. I already have quite a few ideas in the works, but I need your help with a couple things! #1) Planning the food is always my absolute least favorite part of party planning! We'll have people in and out between 2pm and 7pm. I really don't want to cook the day of the party, but it does need to look good and keep people from starving... any ideas for easy to serve pretty party foods? #2) We've hired a professional photographer to do mini photo sessions with the guests. Any ideas for fun props I could put out for people to play with? I also need to come up with a way to make a backdrop or some sort of "stage" area for guests to take pictures themselves. The two things above are my biggest challenges, but I'm excited to hear any party ideas you might have. 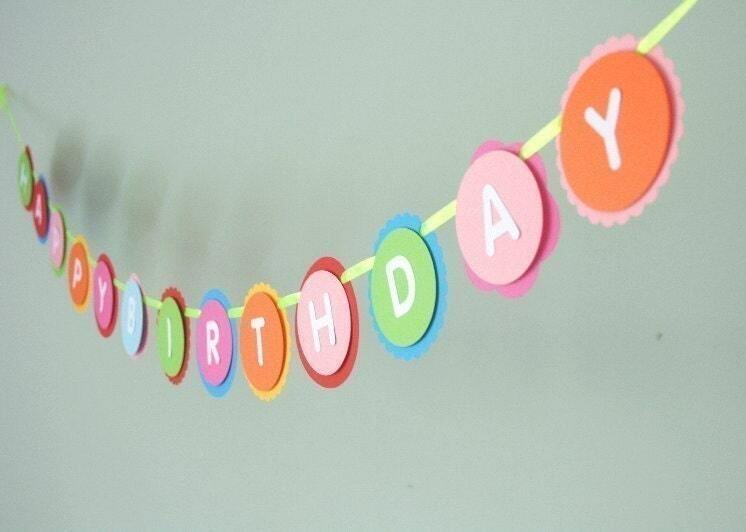 I'd love it if you'd link any party ideas (your own or anything you've found around the web) that incorporate photos. Thanks! A great big giant happy thank you to everyone who entered my Sew Mama Sew giveaway and especially to those of you who decided to stick around to check out what I've got goin' on over here! I have a super cute terry beach cover up to post about coming up and I think I'll break out my bento stash and take some pics of that one of these days too... oh and the pouch bib tutorial is in the works I just need to scan the pattern for you (ooooh my first pattern, I feel so "official"). Now for the lucky winner for the giveaway.... drum roll please... it's KARIE!! Thanks for entering Karie! I'm emailing you now. 1) Check out my Etsy shop and leave a comment telling me what your favorite item is. 2) If you have a minute to take a look around here on my blog, and like what you see (or if you're already one of my most favorite people in the world a.k.a. my blog followers) you can get a second entry for following my blog. Giveaway for US residents only... if only shipping weren't so stinkin' expensive! I'll draw a winner Thursday night. So yea for Kelli of Red Marionette you won the beach towel beach bag! I'll contact you soon. Now onto the stool. 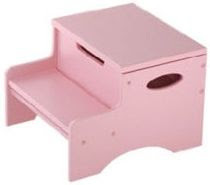 It's the kidcraft step and store stool and I love it! A quality stool is an absolute necessity in a house with kiddos & this one in particular fits the bill perfectly. 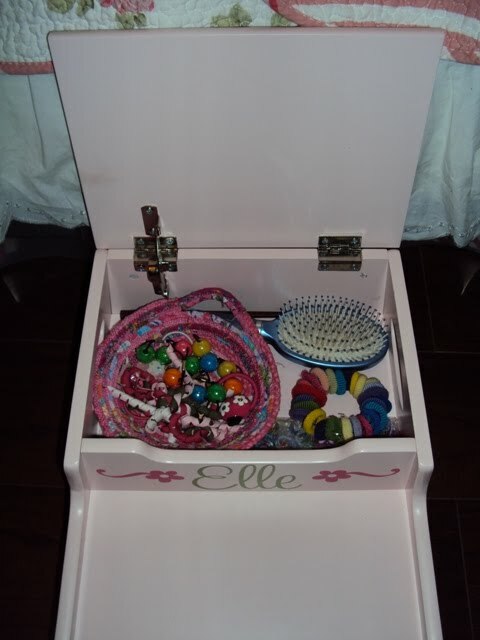 It's pretty light weight and has handles on the sides so Elle can carry it around easily all by herself. It's sturdy too and has already stood up to lots of climbing, sitting, standing, sliding, dragging & wiggling. The only thing it needed was just a bit of embellishment. I'm totally envious of people who have smooth walls because they get to use the product that has revolutionized home decorating... vinyl wall decals. Our house is about a million years old, so we have bumpy plaster walls. I really love the concept of decals though, so easy, so quick, and they can give a room, or an item a complete transformation. I decided decals were the perfect simple embellishment to add just a bit of something special to the stool. What do you think? I've only used decals once before, so I don't know if all decals are this easy to apply & nice looking, but I definitely recommend these from Uppercase Living. UL is a direct selling company who pays demonstrators to market and sell their huge selection of vinyl decals. You can host a party at your house and have a demonstrator come with all kinds of great ideas for decorating your space... neat huh?! But you don't have to have a party to make a purchase, I purchased these (and another one that you'll get a peak at in a future post) from Gina's website: http://ginac.uppercaseliving.net You should definitely take a minute to check out her site, there are some really amazing ideas there! I think my favorite feature of this stool is the hinged step the opens up for storage! 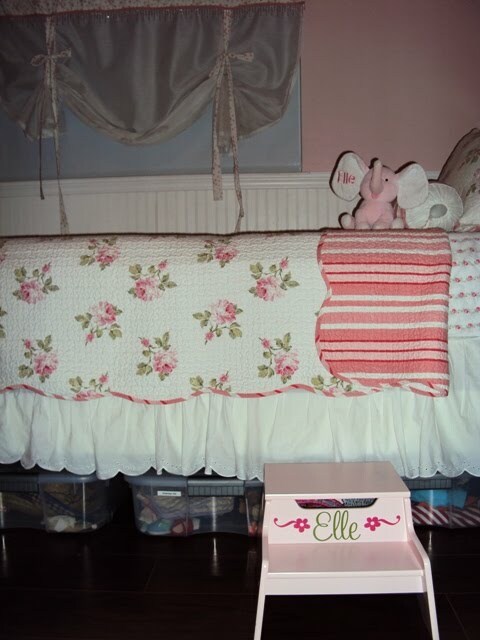 Space is at an absolute premium in our little house (did you notice the rolling under the bed storage boxes in the picture? I try to utilize every little bit of space!). 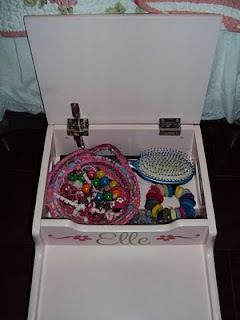 I thought I'd show you what's inside the stool... Elle's hair stuff (minus the bows which are handing on a bow holder in her closet). I love that little rag bowl that holds her hair ties! Oh and do you see my secret weapon for getting perfect parts in long locks? It's up there by the brush... a chopstick! So I posted a while ago about the stool pictured above & asked for some suggestions on how I could embellish it in some way… spruce it up. I said I would giveaway a handmade surprise to one of the entrants, but surprises are overrated dontcha think? I’ve decided the anticipation is more fun. 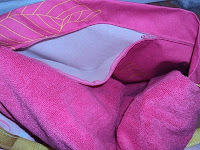 So I’m gonna keep the giveaway going and let you know what’s up for grabs - The beach towel bag from the One Yard Wonders book! 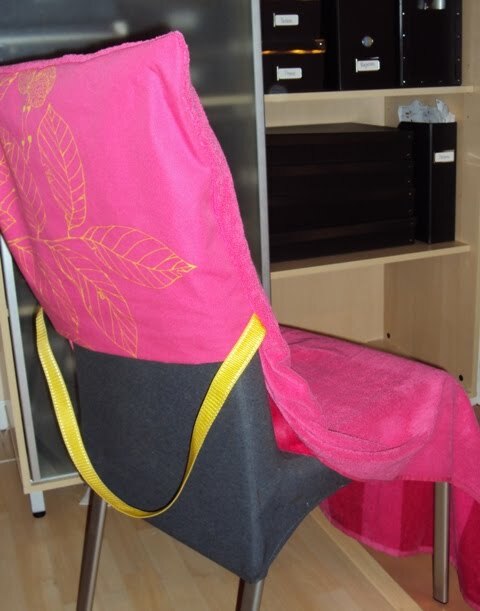 I made this bag with a décor weight IKEA print and a pink stripe beach towel. 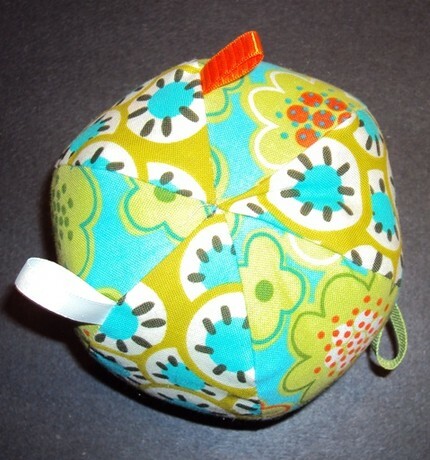 It has a deep zipper pocket for all your beach or pool goodies. 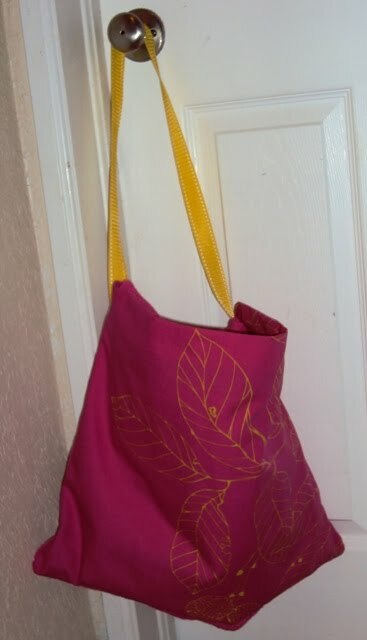 If I lived on the beach, I totally would have set up a little scene for you of a lounge chair with a cold drink nestled in the sand next to it and this super cute bag hung over the top of the chair with the towel unfolded just waiting for you to claim it. Alas, I live at least 10 minutes from the beach (I can feel your sympathy from here), so you’ll have to make do with this picture of it hung over the top of my dining room chair. 1) Leave me a comment with your suggestions for how to spruce up the stool (this one is mandatory to be entered for the giveaway). 2) Get a second entry for following my blog. 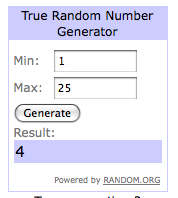 I’ll draw a random winner from all the entrants on midnight (EST) Thursday 5/14. Then I’ll work a little crafty magic on the stool & post a picture of the completed project when I announce the winner. Good luck! One of the blogs I follow, Craft Critique, is hosting a Mother's Day Blog Carnival It's the perfect place to find inspiration for making that special Mother's Day gift. And, not only that, I'm super excited that my post about the collaged clipboard I made for my Mom last Mother's Day is featured in the carnival! So head on over there to check out all the awesome ideas! 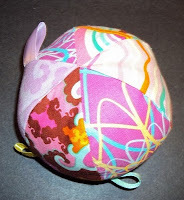 Oh, and if you need even more inspiration, I also made tub teas last year for Mother's Day and the winged wrap carrier would be an awesome gift for the new or soon-to-be Mommy! I have a confession… I don’t make all of Liv’s baby food from scratch. To make matters worse, I did make Elle’s baby food. I never bought one single jar of baby food for Elle. I knew the day would come when she would look at me with those sweet blue eyes and beg to eat a sugary something that wasn’t even remotely close to anything we should consider “food”, and eventually I would probably cave in. But until that day, I couldn’t think of one excuse for feeding her anything but foods that would help her little body grow into the healthiest and smartest it could be. I just couldn’t justify going from the most perfect food, breast milk, to a jar containing who knows what… seriously have you looked at the ingredients on those things?! So I mashed up whatever organic foods we had in the pantry or fridge, added a little water if needed, and fed her with a smile. I had full intentions of feeding Liv the same way. About a month ago, I was planning for a trip to IL with Liv & Elle. We were flying and had a 2 hour lay over to contend with in addition to the 4 hours in the air. I was a little concerned about bringing home made food for Liv even though the airlines make concessions to the rules regarding what you can and can’t bring onto a plane for babies (what if they took Liv’s food?! I could just see the headline now “Mom, enraged by confiscation of avocado baby food, slaps airport security”). I was at the grocery store trying to figure out what to get and decided to just check out the baby food, in hopes there would be something I could live with for just 1 feeding. Just then, a ray of sunshine, beaming straight from heaven, burst through the roof of the grocery store and illuminated the Sprout Organic Baby Food. At least that’s how I remember it. I picked up one of the pouches, flipped it over, and nearly cried with joy when I saw the ingredients: Organic Sweet Potatoes, Organic White Beans, Filtered Water, Organic Cinnamon. I bought almost every pouch of food they had on the shelf. Sprout is a really neat company for lots of reasons (this post is already getting long, so here’s a link to their site so you can check it out for yourself), including why they chose this packaging for their food. I love the packaging almost as much as Liv loves their food! It’s so convenient to just throw it in the diaper bag, it doesn’t take up much room, and if there are any leftovers it zips closed. And the best part is that when people give you a strange look and ask “What’s that? !” you can say “astronaut food” and watch their reaction. Now that I think about it though, maybe I’ll make it into a tutorial for you and its own separate post… yeah, I think I’ll do that instead. Stay tuned! I was just contacted for this amazing opportunity to team up with CSN stores to do a review for them. So I was looking at their websites and little did I know that they have over 200 + sites. They have everything from furniture, to lamps, track lighting,chairs, baby bags, mirrors, seriously they have it all! So what did I pick to review? You'll have to just wait and see... okay I'll give you a hint. It's in some way related to my next post coming up later tonight.